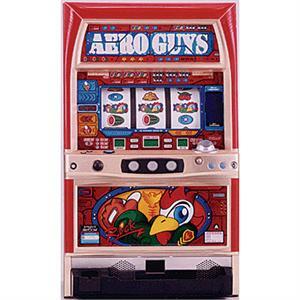 Authentic Gaming Machine Used In International Casinos Product #: 14-AEROGUYS * The machine plugs right in to your wall and there is no installation required (110 volt ready) * Factory re-furbished slot machine * Two year warranty with each machine which covers everything but the light bulbs. * A key for complete access to your machine * Reset switch / Key to change the odds. * Basic operating manual, along with unlimited technical support by phone * We install custom made labels in each machine so that you can easily locate the reset switch, power, and volume controls without referring to the manual (refer to the picture to your left.) * Play 1, 2, or 3 coins at once (some of the newer machines are 3 coin max bet only) If you have a question about the machine listed in this ad please email us. * Accepts tokens only and cannot be readily changed to accept coins * Full light and sound just like you've enjoyed in the casinos for years! * Animated display or video screens (depending on title) * Toll free customer support to answer any and all of your questions How they are refurbished and made ready for your home:After each machine is unloaded from the container they start off by filling in any cracks or holes that are on the outside cabinet. We fill them in with Bondo, then sand them down to be ready to paint. Once the cabinet is ready for paint, we use high quality black paint to restore your cabinet to new condition. Once the paint is dry, we have installed a 4 or 5 AMP transformer to make sure that it will be 100% safe for your home. After the transformer has been put in the machines they are tested to make sure that the transformer is properly working with the machine. Once the transformer was tested, then the machine is cleaned inside and out to restore it back to new looking condition. We check and replace all light bulbs to make sure that they are all working when they leave our warehouse. Once every corner of the machine is cleaned, it is then tested again to make sure that nothing was out of place during the detailed cleaning process. Once the machine has past another inspection by a supervisor, they are then wrapped up so that dust or dirt will not get on them. Your machine is then carefully packed in specially designed foam and boxes. Your machine has been totally refurbished and brought as close to new as possible but some normal wear might be evident due to their previous use in Real International Casinos. We only sell the machines that are the closest to being brand new as we can get them. With each machine we offer a 2 year warranty that covers everything on the machine except the light bulbs. This warranty does not cover any damaged that comes from fire, water, lightning, dropping the machine or any other acts of nature. Please note that the warranty is to the original purchaser and is not transferable unless special arrangements are made at the time of purchase and noted at the time of purchase. Please keep your proof of purchase, the manual and the box and high density foam for each machine. These machines need to packaged properly in order to be shipped. If in the very unlikely event that your machine ever needs to come back to us, if it is not packaged correctly, the machine will be damaged and then we will not be held responsible for replacing the machine. This is why you must keep our original packing. The 2 year warranty covers all aspects of the machine excluding the light bulbs. We do not cover the bulbs but always have them for sale. These machines are very durable and meant for heavy casino use, so with proper use they should last a lifetime. What is a Pachislo? - A Pachislo slot machine is an authentic Japanese gaming machine used in international casinos. In Japan, each casino can only use the machines for 2 years and then they have to take them out. Even though they have up to 2 years to use each machine, they do not always take the full time. This is why some machines are practically brand new when you get them. Whether they are 1 month or 5 years old, Pachislo machines are a great way to entertain your friends and family. They are high quality, backlit machines, with brilliant flashing lights, and electronic sounds. Depending on the model, some have animated LCD or LED displays or video screens. When new, these machines cost over $3500. Pachislo slot machines feature skill stop reels which is why they are also called Skill Stop Machines. You control when each reel stops, putting skill into the game. Some machines even offer interactive video screens for more exciting play. Pachislo machines do not have pull down arms on the side of them. The reels are stopped by using the 3 buttons on the front of the machine, which is why it is called a Skill Stop machine. These machines are not meant to have pull-down arms on them. Although arms for the machine can be purchased for your machine, altering the machine in any way will void your warranty and we will not be responsible for any problems you encounter with the machine.